Born in California in 1945, Kay Ryan has said that her poems don't start with imagery or sound, but rather develop "the way an oyster does, with an aggravation." Her unique brand of tightly compressed brilliance has earned her the status of one of the great living American poets, and led to her appointment as U.S. Poet Laureate in 2008. Megan O'Rourke has written of her work: "Each poem twists around and back upon its argument like a river retracing its path; they are didactic in spirit, but a bedrock wit supports them." "Sharks' Teeth" displays that meandering approach to her subject matter, which, Ryan says, "gives my poems a coolness. I can touch things that are very hot because I've given them some distance." Maintaining a career outside the mainstream poetry circuit, Ryan teaches remedial English in California's Marin County, where she's lived for the last 30 years. She is the recipient of several major awards, includng fellowships from the National Endowment for the Arts and the Ingram Merrill Foundation, and the Ruth Lilly Poetry Prize. 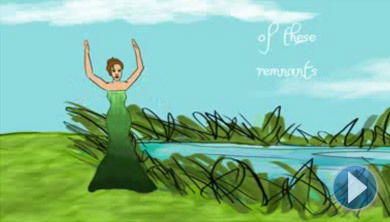 This animation was created by Kristin Vogel, and Ryan reads. To read this and other poems by Kay Ryan, as well as biographical information about the poet, please visit the Poetry Foundation Web site.